From its early origins in the late sixties, when a group of sailors got together to do sail fish sailing on Saturdays, to the energetic people who are members of the club today, the Antigua Yacht Club is the centre of the yachting community in English and Falnouth Harbours. Today the club is involved in many excellent events including The Classic Yacht Regatta held every April, the Caribbean 600 (the first one took place in February 2009), and Sailing Week. 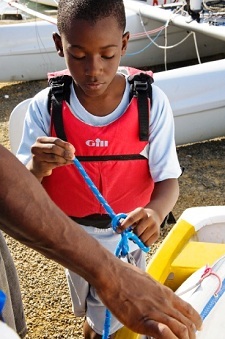 Aside from the large regattas, the club is active in getting youth involved in sailing with the Youth Sailing programme, and also runs regular races in and around Antigua waters. Our sailing instructor is ex-Olympian Karl James who teaches people of all ages as well as instructs the Youth Sailing Programme. The Yacht Club itself has become a great place to have a drink and catch up with sailors, as well as run some excellent fundraisers for a number of good causes, including A.B.S.A.R. The upstairs floor of the club is operated by Club Sushi, a superb restaurant serving delectable steak and sushi. For members there is Happy Hour daily from 5 - 7 pm with drinks specials such as EC$6 on local beer, well highballs & house wines. Antigua Yacht Club (AYC) members also get 20% off their whole bill at any time while dining, but must show their membership card. Good health, fair winds and God Bless.